There is something very challenging about a conversation which begins with the words “you have done a great job this year I don’t know how you will do anything better next year”. That was a conversation we had in early March 2014. The gauntlet had been laid down for this years annual sales conference for one of the nations most popular confectionary companies. The Team at Team Tactics received the brief in October last year with the theme being around sport and working together, we had to create and present two events over two days lasting an hour and a half each. After sitting down as a Team we decided to present two very different Team Building events, which we presented to the client in early December which they loved and booked straight away. So here we are in early March at a hotel in Northamptonshire with 200 delegates totally oblivious to what was about to happen over the next few days. The Team Tactics event managers had arrived early to ensure the first event went with a bang and so it did at 3pm when 5 genuine Maori warriors burst into the conference centre mid-way through a speech by one of the senior management team (who was aware of what was about to happen). 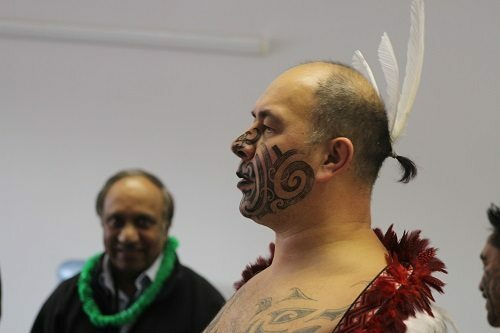 The Maori then proceeded to perform the Haka to a room full of surprised sales agents. After the Haka on stage we split into four syndicate rooms each with a Maori to learn and practice the Haka. Involved with this was the knowledge and history behind the ancient tradition. 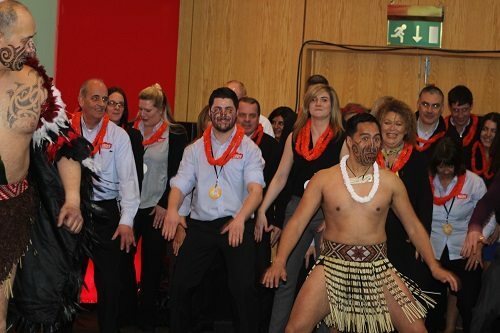 After an hour everyone returned to main conference room for a Haka off, each Team performing to each other with the Orange Team winning in the end. It was a fantastic way to get the delegates together and working as a team and working outside of their comfort zones. On the second day the delegates were divided into 13 new sales divisions and we planned an event to get people who had never worked together to work as a Team. For this event we had 13 one metre square boxes delivered each locked with two different padlocks securing the lid. Each Team had 90 minutes to get into the box(not as easy as you think) and then complete a number of logic problems and practical tasks, build a giraffe out of A4 paper only, stick a nail through a balloon without it popping. This event had everyone taking part and working to strengths. It was to see one lady spinning three plates on three sticks at once and all her team saying I dint know you could do that, to which she replied neither did I. A great two day event and the feedback on both events has been first class. A mixture of fun, team building and bonding. Once again we have the great challenge of what we will do in March next year. The first meeting takes place at the end of April. Check out our Haka page for more information on the event, also make sure you view our new Haka video from this event on our Youtube Channel.